For some, perhaps, it is a name that conjures little—another in a list of diocesan and national figures who have little directly to do with their home parish. 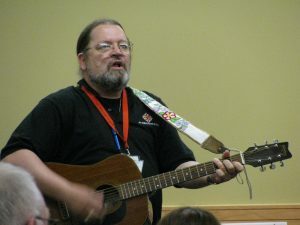 Others may know MacDonald for his involvement in reconciliation and Indigenous activism, or for his sermons on environmental justice, or his columns in the Anglican Journal—or even for his talent on the acoustic guitar at a gospel jamboree. But MacDonald (and more importantly, the office he holds) is also the most visible example of structural change in a church still struggling to build a more equitable relationship with its First Nations, Inuit and Métis members. The position of National Indigenous Anglican Bishop was created a little more than a decade ago, following a proposal at the 2005 Anglican Indigenous Sacred Circle (the national body that meets triennially to manage the affairs of indigenous Anglicans). 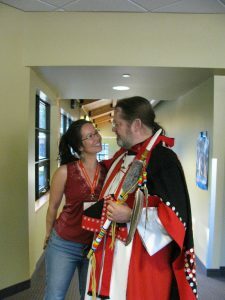 Sacred Circle tasked the Anglican Council of Indigenous Peoples (ACIP) with presenting a “fit and qualified” nominee who was both Indigenous and an Anglican bishop to then-Primate Andrew Hutchison for formal approval. Bomberry recalls that MacDonald, then serving as bishop of Alaska in The Episcopal Church (TEC), was selected because ACIP found his vision for the indigenous Anglican church to be very much in line with their own. Teresa Mandricks, program associate in the secretariat of the national indigenous Anglican bishop, who was also involved in the interview process, noted that his charismatic, easygoing nature and democratic approach to decision-making was an important factor in choosing him. “He was cool, you know? He just had a charisma…that you know you can just go to him and talk,” she says, remembering the first time she met him, at the 1997 meeting of Sacred Circle. 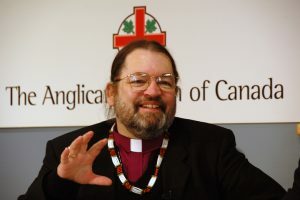 On January 4, 2007, MacDonald made history by becoming the first national bishop representing the interests of all indigenous Anglicans across Canada. While he now operates out of a corner office in downtown Toronto, and spends his time criss-crossing Canada and the globe, MacDonald’s early years were spent in the small port city of Duluth, Minnesota, where he was born on January 15, 1954. MacDonald recalls his family situation as being “troubled,” and his grandfather’s experience as a residential school survivor cast a long shadow of intergenerational trauma over the future bishop’s childhood. But it also prepared him for the kind of ministry he would spend much of his adult life engaging in. MacDonald heard a call to the priesthood while still in his teens, a development he sees as being deeply connected to the experiences he had growing up. After graduating from St. Scholastica, he studied at Wycliffe College in Toronto, receiving an MDiv in 1978 and beginning his ministry as a priest in the diocese of Minnesota the next year. Like many young priests, he struggled to discern exactly what he was being called to do. For MacDonald, the answer came while serving as rector at St. Stephen’s Episcopal Church in Portland, Ore. Shortly after he arrived, the parish began to foster an indigenous mission congregation, which MacDonald became priest-in-charge of. When he left St. Stephen’s in 1989, it was to immerse himself completely in ministry to Indigenous people—specifically, the Navajo of the Episcopal Church’s Navajoland Area Ministry at the juncture between Arizona, New Mexico, Colorado and Utah. It was here, MacDonald says, that his own indigenous Anglican perspective began to take shape, influenced by the perspectives of the elders around him, whose theology was rooted in an understanding of the gospel and the world that he believes is closer to that of the early church than they are to 20th-century Western Christianity. Five years later, though, a job opened up back in Minnesota, and MacDonald felt it was time to go home. In 1997, he put himself forward as a candidate for seventh bishop of Alaska. He was consecrated September 13 of that year, and would spend the next decade based out of Fairbanks, Alaska. “As I said at the time, it’s the only place I could imagine wanting to be bishop, and the only place that I can imagine anyone wanting me to be a bishop,” MacDonald recalls with a chuckle. In the months following the 2005 Sacred Circle, MacDonald was approached by ACIP. Would he be willing to consider standing as a candidate for the new position the Anglican Church of Canada had created? MacDonald says he knew immediately that, despite the challenges, this was an opportunity he couldn’t pass up. “I felt that there would be great difficulties, but there probably wasn’t anything, missiologically speaking, that was more important and more critical in North America,” he says. Not that this made stepping into the new role easier. Not only was MacDonald faced with the enormous challenge of shaping a completely new episcopate, he also needed to convince his fellow bishops that his work wasn’t a threat to their own. “Not everyone was happy with the creation of the position,” he recalls. Navigating his new role was not just about facing the expectations of his Indigenous constituents, it was also about reassuring his fellow bishops that he would respect their own jurisdictions. He would face this balancing act again and again in the coming years, as he worked to build better ties between Indigenous and non-Indigenous Anglicans. “He’s the go-between,” says Mandricks, describing MacDonald’s position as a leader who must have a foot in both Indigenous and non-Indigenous worlds. This position was vital in the years following 2007. Not only was the indigenous Anglican church breaking a new trail toward the creation of a fully self-determined Indigenous Anglican church, Canadian Anglicans as a whole were wrestling with their church’s colonial history, through the Truth and Reconciliation Commission (TRC). The commission held its first national event in Winnipeg in 2010, and would hold six more before it released its final report in June 2015. 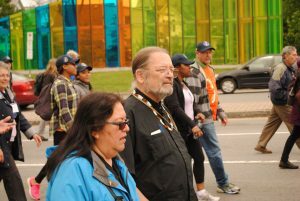 While most of his involvement with the TRC was pastoral, MacDonald says he thinks the commission’s work has done much to raise the profile of Indigenous Anglicans’ struggle for self-determination. When asked about the nature of these ongoing issues, MacDonald says a lot of it comes down to institutional racism that manifests itself as a paternalistic attitude toward Indigenous peoples. In attempting to break this cycle, indigenous Anglicans want greater control over their own affairs, and a greater ability to minister to their own people in their own way. MacDonald is optimistic that it’s just a matter of time, in part because of the way he has seen indigenous leadership develop in the time he has been bishop. MacDonald speaks with particular pride of the number of indigenous leaders who have taken their places on the national stage—like Lydia Mamakwa, bishop of the Indigenous Spiritual Ministry of Mishamikoweesh, and Adam Halkett, bishop of Missinippi in the diocese of Saskatchewan. “More has happened in these 10 years than I ever imagined possible,” he says. This year marks the 20th anniversary of MacDonald’s consecration as bishop, and in 2019 he will have been serving the church as an ordained minister for 40 years. 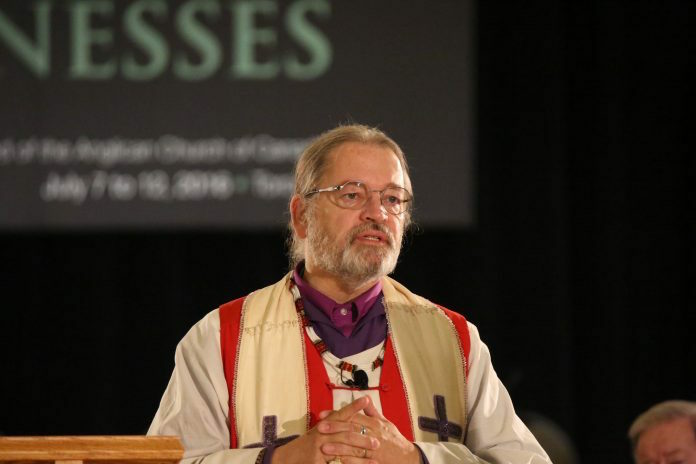 So is the Canadian Anglican church’s first National indigenous bishop thinking about slowing down? Thank you so much for your ministry, Mark. I will be holding you in prayer!